Hasbro has a history of producing quality licensed toys - especially for the Star Wars franchise. 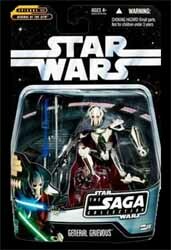 Its latest range action figures, for the Star Wars: The Saga Collection, carry on this tradition and ensure that the latest generation of Star Wars fans get some of the best quality figures on the market. 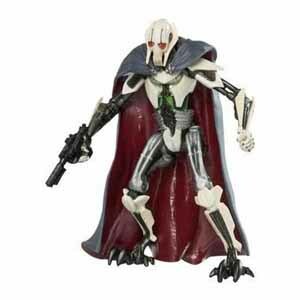 Action figure number 030 in General Grievous. This detailed figure will ensure that young fans of the movies can re-enact their favourite scenes. The attention to detail that has gone into this figure is impressive. Not only do we get a fully poseable action figure that has been painted well, but the packaging also acts as an attractive display for collectors that don't want to break the figure out of its blister pack. This figure also comes complete with a gun, a lightsabre, a stun rod and a mini holographic Darth Vader figure (which is just a small figure that is made from blue translucent plastic). You also get a small plastic stand that has: "Star Wars: Revenge of the Sith" embossed on the top. For the price you really can't grumble. Yet another first rate piece of Star Wars merchandise.